The US Government has said it plans to maintain legal jurisdiction over US forces in Iraq after the handover of sovereignty at the end of June. It is taking the action so its forces are not subject to Iraqi courts. 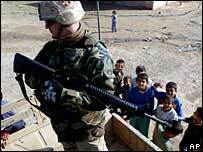 US defence officials say the intention is that this would be done with the agreement of the Iraqi people. At least 89 people were killed on Thursday in a fresh wave of attacks, just six days from the handover of power to an interim Iraqi government. A Pentagon spokesman said negotiations were under way with the Iraqi authorities and that the mechanism to ensure US jurisdiction still had to be finalised, but he added that he believed the two sides would conclude an agreement on this. The White House went so far as to say that there was an agreement in principle - but this is a sensitive issue, particularly now because of the continuing controversy over the abuse cases of Abu Ghraib prison. A senior US military official also said that the plan would be that all foreign coalition forces would continue to be immune from Iraqi prosecutions. There are about 140,000 US troops currently in Iraq and 25,000 from other countries. The most likely option at the moment appears to be that the current US administrator Paul Bremer would extend what is known as Order 17, which gives all foreign personnel in Iraq protection from prosecution in Iraqi courts.